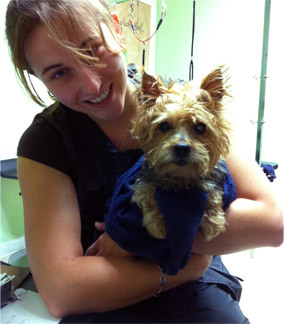 At Fursique our goal is to provide customers and their pets with affordable, reliable and professional care. We take pride in educating our customers about their pets needs as well as being able to implement proper procedures and use products that are best for each animal. Quality treatments and services for dogs and cats is our specialty, along with giving each of our human and animal clients the utmost care and respect. We strive to be the cleanest shop by maintaining a disinfected and hygienic atmosphere. The well being of the animal, customers concerns and expectations and cleanliness are always our top priority. Fursique offers full pet grooming as well as add ons, express services and spa treatments. We are located in the Galleria Shops plaza in Feeding Hills. Appointments will be made either by phone or in person. Appointments for full grooming and some special packages should be made in advance; however, please contact us if immediate or emergency needs should arise.